I am looking for, 4 small icon style images for my site. 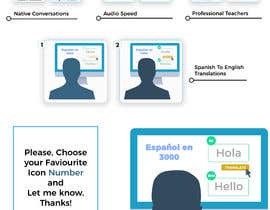 My site is called "Español en 3000" and we have digital products and conversational study products for the Spanish language learning market. Our main service is conversational audio recordings and transcriptions for studying to increase conversational fluency. I am not looking for very complicated images, but images that show a nice clear point to the theme as described below. The locations that the images will feature is where there is a '4 horizontal image section' on both of the above web pages, also see the screenshot in the attached images. The images that you will create, will replace the current images. This image could show the action of conversations between people or the learner listening to the audio and reading the transcriptions. This image I would like to show the ability that we have to be able to slow down the audio player. Maybe some type of speed control slider? This image could show some type of graphic of translations or a person speaking Spanish words? This image could show some graphic of a teacher or something to do with grammar. I have given a few ideas here under each image theme, but I am 100% open to ideas from you and what you can come up with. Hello Sir. i am working on these banner, do you have some particular dimension? Great! No exact dimensions at the moment. Just square and suitable dimensions for use on a website. I like where your designs are going #4 - Babar H.
But if we could please make them less business style people and more fun average people. Maybe include only 2 people talking in the first image on the right. And maybe we could include some headphones or something in the speed control image. Also, I like the 3rd image for the translation but I think it would be better showing someone clicking a word and the translation popping up in a website? Please do not include any words in the graphics.